Cheyenne River Indian Outreach staff enjoyed a roast beef dinner and lots of laughs during their annual Christmas party. 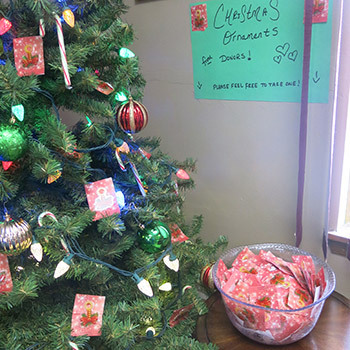 A special thanks to the donors who sent back Christmas ornaments and blessings — we’re so grateful for your support! For the Child Services Center, St. Joseph’s Indian School, and our board for being here for the youth. For the Priests of the Sacred Heart who founded our organization. For the caseworkers at the South Dakota Department of Social Services for being so supportive of the youth who reside at the Cheyenne River Indian Outreach Youth Center. For the staff at Cheyenne River Indian Outreach who are so compassionate to all our clients, past and present. For our training in First Aid and mental health, to help us meet the needs of the victims of violence who come to us for help. I am especially grateful to the donors who make our work possible. Together, we are changing lives!